→What Does Vanilla Extract Do That Is Simple And Easy? 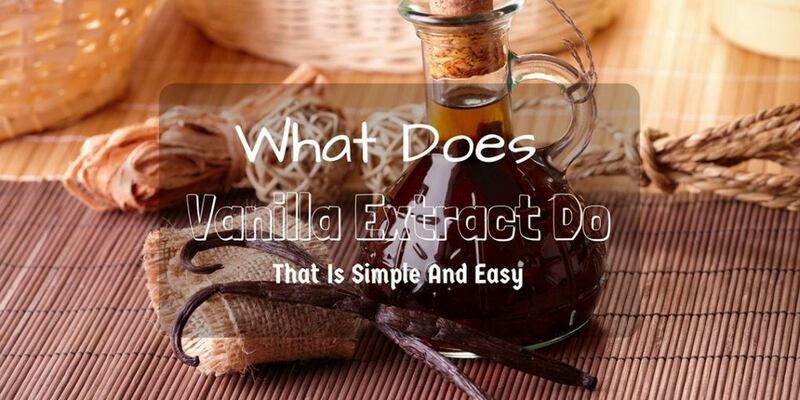 What Does Vanilla Extract Do That Is Simple And Easy? Do you often see the vanilla extracts on cakes and cookies recipes? What does it do? How is it used? The way you are curious, I was also interested to know what I can do with the vanilla extract in the kitchen. What does vanilla extract do? The following information will help you to understand more about the vanilla extract. It is sold in supermarkets and can be extracted at home easily. It gives a soft, sweet flavor when used in baking recipes. It can be used in cakes, pies, and cookies. The naturally pure vanilla has the best taste as compared to the one that is synthetic. The pure extra contains almost 500 components that are organic. The synthetic vanilla is cheaper than the pure vanilla extract. It only contains one organic component. You only need to use a small fraction of the pure extract because its flavor is so strong. Ensure that it doesn’t overpower the other ingredients. If the recipe needs the synthetic extract, it should be decreased by 1/3. The vanilla extract has an appealing, strong aroma in baking recipes. This can make the food to be more appetizing when it is smelled. This can be used in aromatherapy. It is used to calm the nerves of animals and humans when they are under stress. This is why it is used in soaps, candles, and bath oils. You can also use this aroma to deodorize the microwav﻿﻿e oven and the fridge. You only need to wipe them with the extract. If you want the scent to remain for long, soak a cotton ball in the extract. You can also remove the odor of fish in the microwave by heating the vanilla extract over high heat for about a minute. Mix the butter and the sugar together with a mixer. The mixture should be creamy and light. Add the eggs as you turn the mixer down. Increase the speed to medium and beat them well to incorporate. Add the vanilla bean and mix well to incorporate. Mix the flou﻿r, baking powder, salt, and the orange zest in a different bowl. Blend them together until they combine. Combine the egg mixture and the flour mixture together to make the dough. Smear the baking pan with some butter and pour the dough into the pan. Bake for about 40 minutes. Let it cool and serve with a cup of coffee or tea. Enjoy! Chill the dough for more than one hour before you start to make the pies. Mix the sugar, cinnamon, cornstarch, and the lemon zest in a bowl. Set the mixture aside. Use the lemon juice to coat the blueberries in a bowl. Sprinkle the sugar mixture and stir for even coating. Roll out the dough and cut it into circles of 5 inches in diameter. Fill the circles with blueberries at the center. Combine the egg yolk with 2 tablespoons of water. Use the egg to brush the edges of the dough. Fold them in half and use a fork to seal the edges. Chill the pies for about half an hour before you bake. Preheat the oven up to 375 degrees F. Take the pies from the fridge and brush them with the remaining egg. Sprinkle with the sugar and cut a small slit on top of each pie. Bake the pies for about 20 minutes, they should be flaky and brown. Let the pies cool to room temperature before you serve. Mix the almond paste and butter together in a mixer. The mixture should be fluffy and light. Add the sugar and continue mixing until they are well incorporated. Add the eggs and ensure that you scrap the bowl at the bottom. Heat the milk and add the saffron as you stir. Take the mixture from the heat and set aside. Mix the remaining dry ingredients together. Add the sour cream alternating with the dry ingredients until they all incorporate. Add the milk with saffron and continue to mix until they incorporate. Smear the round pan with butter. Put the dough on the pan and bake for about 30 minutes at 350 degrees F. The center should be able to spring back when it is gently touched. Take it out of the oven and let it cool and driz﻿﻿zl﻿﻿e with the vanilla syrup. How do you use the vanilla extract? Do you love the aroma and the flavor of the extract? Do you have any other recipe that uses vanilla? Feel free to share with us what you think in the comments section.